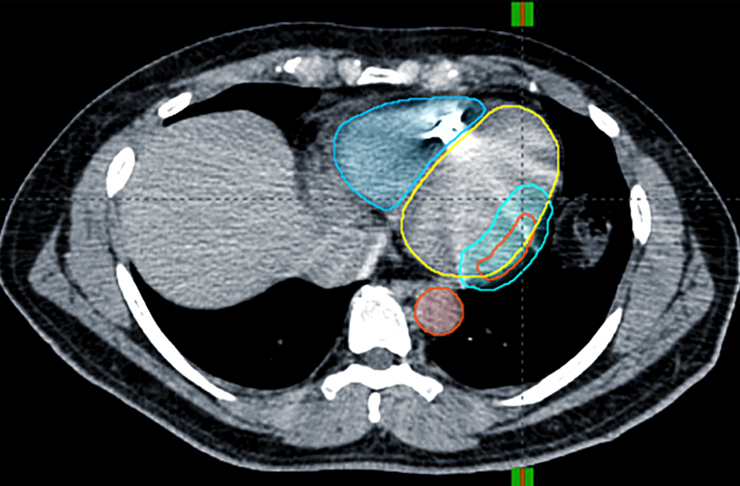 In a small study with five patients, doctors have shown that radiation therapy—aimed directly at the heart—can treat patients with a life-threatening heart rhythm, called ventricular tachycardia. The patients had not responded to standard treatments and collectively experienced more than 6,500 episodes of ventricular tachycardia in the three months before they were treated with radiation therapy. In ventricular tachycardia, the heart beats exceedingly fast and its chambers often fall out of sync, interfering with blood flow and placing patients at risk of sudden cardiac death. When delivered directly to problematic areas of the heart muscle, the radiation therapy resulted in a dramatic reduction in the number of ventricular arrhythmia events in these patients, as measured by their implanted defibrillators. There have been two previous cases reported of treating ventricular tachycardia with radiation therapy, but researchers say this is the first to do so in an entirely noninvasive process, from imaging to treatment. At the same time, cardiologist and first author Phillip S. Cuculich, an associate professor of medicine, was looking for new ways to treat ventricular tachycardia in patients who did not respond to conventional treatments. Ventricular tachycardia is estimated to cause 300,000 deaths per year in the United States and is the leading cause of sudden cardiac death. Standard therapy includes medication and invasive procedures that involve threading a catheter through a vein into the heart and selectively burning the tissue that causes the electrical circuits of the heart to misfire. The five patients in the study had undergone catheter ablation procedures and their ventricular tachycardia returned, or they were unable to go through the procedure because of other high-risk medical conditions. One patient was on the waiting list for a heart transplant. Four of the patients were in their 60s; one patient was older than 80. In the three months before treatment with noninvasive radiation therapy, the five patients together experienced more than 6,500 ventricular tachycardia events. The average number of events per patient during this time was 1,315, with a range of five to 4,312. During the first six weeks following radiation therapy, as the patients were recovering, they experienced a total of 680 episodes. In the one year the patients continued to be followed, they collectively had four events. Two patients didn’t experience any episodes at all. The investigators are cautious, saying they are still monitoring for long-term side effects of radiation therapy, such as lung scarring and further damage to the heart itself. They emphasized that their use of external radiation to the heart only included very ill patients in end-stage disease who had run out of options. More research is required before doctors might consider this approach for younger, healthier patients or as a possible addition to standard therapies. The preparation and mapping of the anatomy and electrical circuits of the heart is time-intensive, but the treatment itself only takes 10-15 minutes, the researchers say. “A traditional catheter ablation procedure can take six hours or more and requires general anesthesia,” Cuculich says. “This new process is entirely noninvasive. We take pictures of the heart with various imaging methods—MRI, CT, PET scans. “But the unique piece is the noninvasive electrical mapping called electrocardiographic imaging. This allows us to pinpoint where the arrhythmias are coming from. When we overlay the scar mapping with the electrical mapping, we get a beautiful model of heart function that lets us see not only where the arrhythmia comes from, but where it might progress,” he explains. Coauthor Yoram Rudy, a biomedical engineer and professor of engineering, developed electrocardiographic imaging (ECGI). The radiation therapy doesn’t take effect immediately. The number of arrhythmia events went down but didn’t disappear in the first six weeks after treatment, which the doctors characterize as a recovery period. After that six-week period, however, the number of events dropped to almost zero. Patients were able to slowly come off medications used to control the arrhythmia. Can math predict erratic heartbeats? Of the five patients, one patient died in the first month after treatment of causes unlikely to be related to treatment. This patient, who was older than 80, had other heart conditions in addition to ventricular tachycardia. The remaining four, who are all in their 60s, are alive two years after radiation therapy. The patient on the transplant list went on to receive a new heart. One whose arrhythmia continues to be controlled is also dealing with gradual heart failure, meaning the heart muscle is weakening over time, and has received a left ventricular assist device. Two patients continue to live unassisted without ventricular tachycardia. The researchers report an analysis of the patients’ experiences in The New England Journal of Medicine. Washington University School of Medicine in St. Louis; the Barnes-Jewish Hospital Foundation; and the National Institutes of Health (NIH) supported this work.